James Mitchinson, left, has been given the job of group editor of Wilfred Edmunds Ltds/North Notts Newspapers after a lengthy selection process. The role includes the hands-on editorship of the Derbyshire Times and ultimate editorial oversight of 17 other sister titles including the Mansfield Chad, Buxton Advertiser, Matlock Mercury and Ilkeston Advertiser. James succeeds Nicola Megson who stepped down before Christmas to move to Brussels where her husband, ex Sheffield Star editor John Furbisher, now works at the European Parliament. The move represents a further stellar promotion for James who was made group editor of the Grantham Journal and seven sister weekly titles in JP’s Lincolnshire Newspapers division only last year. 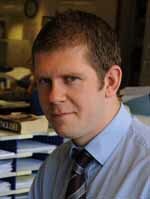 Before that, he had been editor of the Worksop Guardian, the paper he first joined as a trainee in 2002. After working his way through the ranks at the Guardian, James became editor in 2010 when the late George Robinson stood down to run an antique toy business. Other titles that will come under his oversight in his new role include the Eckington Leader, Ripley and Heanor News, Belper News, Eastwood and Kimberley Advertiser, Hucknall Dispatch and Mansfield & Ashfield Observer. James’s current role of group editor at Lincolnshire Newsapers is now being advertised on HTFP. From trainee reporter to editor of 18 titles in nine years? I did it in seven. Actually it was only 15 titles, but still. It’s been all down hill ever since, mind. Having worked with Jamie for almost four of those years, I’m sure he’ll do a cracking job. Calm under pressure, excellent judgment and taught by the very best in the business – the late great George Robinson. Good luck J!